Dario A. Cortes, PhD, Senior Vice President, Strategic Alliances, Berkeley College, and Executive Director, Berkeley College Foundation, Inc., was recognized for his contributions to education at The Institute for Latino Studies signature event, the Illustrious Awards, held on September 23, 2017, in Newark, NJ. The ceremony honored 57 Latino leaders from the tristate area for their dedication to their communities through initiatives in business, education, government, the arts, and many other areas. Dr. Cortes served as the President of Berkeley College from 2008 to 2015. During his presidency, he led the College through a period of reorganization and expansion, including, the creation of five schools to align academic programs with Associate’s, Bachelor’s, and Graduate’s degrees and certificate programs. As Senior Vice President of Strategic Alliances, Dr. Cortes continues to lead Berkeley College’s efforts to educate first-generation and underserved students. In April 2017, Dr. Cortes contributed to the launch of the institute’s Bridge to College and Careers program, which offers mentorship, career exploration, workshops and Advanced Placement college courses to New York City high school students. Click here to learn more about the Berkeley College Bridge to College and Careers program. As Executive Director of Berkeley College Foundation, Inc., Dr. Cortes is responsible for managing events and activities that will support the 501(c)(3) charitable organization in its mission to raise scholarship funds that are primarily awarded to Berkeley College students. Click here to learn more about the Berkeley College Foundation, Inc.
Dr. Cortes is a distinguished scholar and lecturer who has authored two books on Latin American literature. He was re-appointed as Commissioner of Middle States in 2016, and is active in many community, civic, and professional organizations. 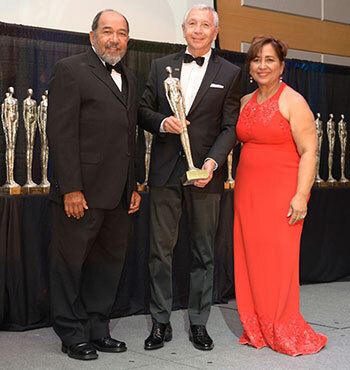 Photo Caption: Dario A. Cortes, PhD, Senior Vice President, Strategic Alliances, Berkeley College, and Executive Director, Berkeley College Foundation, Inc. (center), receives recognition for his contributions to education at The Institute for Latino Studies signature event, the Illustrious Awards, held on September 23, 2017, in Newark, NJ. Also pictured above is Martin Perez, Esq., Partner, Perez & Bombelyn, and Founder, the Latino Leadership Alliance of New Jersey (left); and Maria Teresa Montilla, PhD, President, Institute for Latino Studies and the Latino Leadership Alliance of New Jersey.